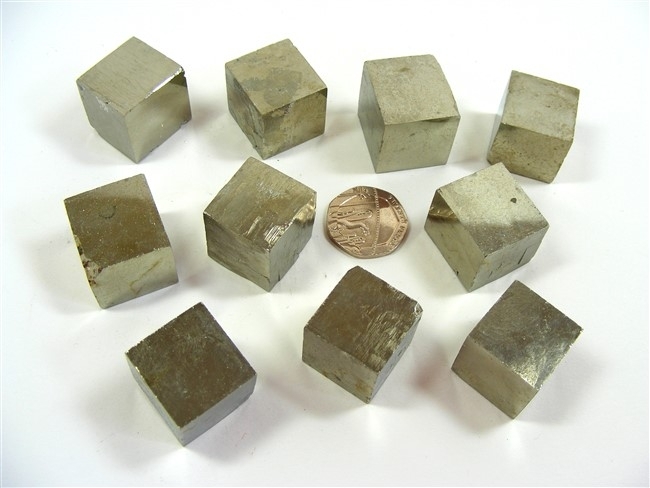 Despite their machined man-made look, these "cubes" of Iron Pyrites are 100% natural. Amazingly, this is how they are found in the ground !! These pieces really are a good size and every one is a lovely golden colour. 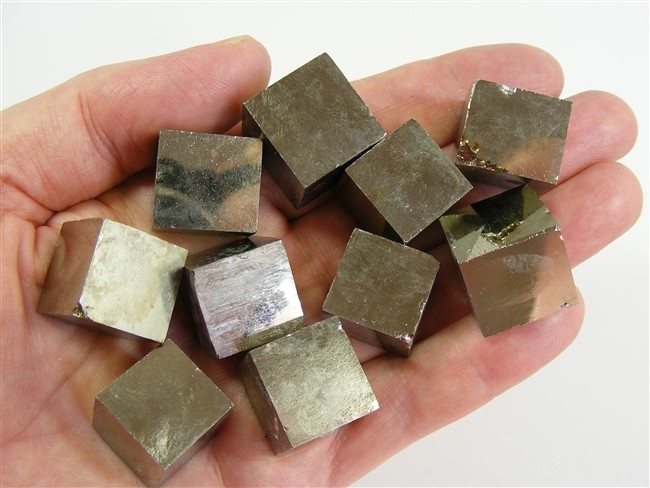 Iron Pyrites may be beneficial for treating disorders of the lungs, asthma and bronchitis. It is said to calm the digestive system, to lessen fevers and to reduce inflammation. Iron Pyrites helps us overcome fatigue and it can restore disturbed sleep patterns where this is due to something you have eaten. Iron Pyrites brings us mental clarity and focus. It dispels feelings of inertia and inadequacy and helps to free us from anxiety and frustration. It stimulates our intellect and generates the flow of ideas, boosts our self confidence and helps us to be more energetic and creative. All this makes it an ideal mineral for those studying art, mathematics, science, sculpture etc, or anything else requiring original thinking. Iron Pyrites also helps us to remember the warmth of the sun and to recall beautiful memories of love and friendship. It also helps us to more clearly see exactly what lies behind other peoples words and actions. Iron Pyrites helps us to recognise both the purity and the perfection of the universe. It is an excellent protective mineral and defends the wearer or carrier from all sorts, and all types, of negative energy. It blocks energy leaks from the aura and has a unique protective power. It should be kept in our possession when we are doing any dangerous work.